Maintaining an HVAC (Heat, Ventilation and Air Conditioning) unit is important to prevent major problems from affecting your home or business. 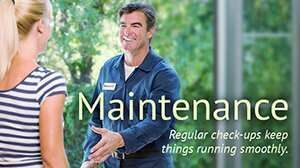 HVAC maintenance will not only lower your utility costs, but it will help increase the service life of your unit. Longer life means less money out of your pocket spent on repairs or new systems. Below is a look the parts of an HVAC system and why they need to be cleaned or replaced periodically. A HVAC system consists of several parts that function together to heat and cool your home or apartment building. The main components of an HVAC system include filters, evaporator and condenser coils, air intakes, dampers and supply ducts. An HVAC unit also contains fans, bearings, and belts that must be regularly cleaned to keep your unit running smoothly. Dirt, debris or other matter found in any of those components can result in the reduced functioning of your HVAC unit. Filters are rated by a using an ASHRAE (American Society of Heating, Refrigerating and Air-Conditioning Engineers) standard; a higher rating on a filter means it is more efficient at removing small dirt and debris particles from the air. A rating of 11 or higher is considered to be efficient. The type of filter affects air quality, with cotton or synthetic pleated fabric filters offering the best and most effective filtering power. Replacing filters is perhaps the easiest part of HVAC maintenance. Coils have a tendency to grow mold, due to being damp and wet. They are also in contact with humid, moist air, a breeding ground for mold and bacteria. Coils can also easily degrade if left dirty for extended periods of time. Left untreated for too long, coils will grow a sticky film on them that is extremely difficult to clean. The cleaning chemicals needed to treat this mold have a tendency to damage and pit the coils, requiring them to be replaced. Dampers keep the HVAC unit operating efficiently by keeping compressors running when the temperature dips below 60 degrees Fahrenheit. If they are not kept properly cleaned and lubricated, they will begin to stick, creating a loss of cooling and heating efficiency in your HVAC unit. Proper HVAC maintenance should include keeping the dampers well serviced, as this is the most common problem seen in HVAC systems. Fans and belts are of the least concern during HVAC maintenance, but should still be maintained and replaced at least twice per year. Poorly operating fans or belts result in less cooling and heating efficiency, excessive noise coming from the unit, or constant vibration while running. Well-kept fans and belts mean a smoother running HVAC unit that requires less maintenance and will function longer without repairs. Paying attention to these details will help maintain a well-running and efficient HVAC system. HVAC maintenance should be completed right away if homeowners observe any problems, or if any building tenants complain of heating and cooling problems or strange noises coming from the system or ducts. This could signal a problem that needs immediate attention.